Review by AllTheBestFights.com: 2015-11-07, disappointing fight between Rashid Magomedov and Gilbert Burns: it gets two stars. The former M-1 Global Ww champion Rashid Magomedov entered this fight with a pro record of 18-1-0 (50% finishing rate) and he is ranked as the No.18 lightweight in the world. He suffered his only loss in 2010 when he faced Magomedrasul Khasbulaev (via split decision), since then he has won 11 consecutive bouts beating Elias Silverio in his last one (=Magomedov vs Silverio). His opponent, the black belt in Brazilian jiu-jitsu Gilbert Burns, has a perfect record of 10-0-0 (90% finishing rate) and he entered as the No.45 in the same weight class. He has fought once in 2015 winning over Alex Oliveira (=Burns vs Oliveira). 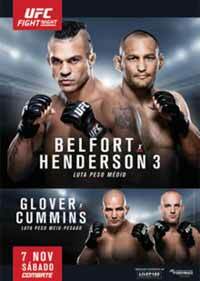 ‘Durinho’ Burns vs Magomedov is on the undercard of Vitor Belfort vs Dan Henderson 3 – UFC Fight Night 77. Watch the video and rate this fight!